CORRECTING and REPLACING PHOTO Element Hotels Unveils Design-Led Solar Collaboration with Sistine Solar, Inc. Please replace the photo with the accompanying corrected photo. ELEMENT HOTELS UNVEILS DESIGN-LED SOLAR COLLABORATION WITH SISTINE SOLAR, INC. Element Hotels, Starwood Hotels & Resorts Worldwide, Inc. (NYSE:HOT) eco-innovation lab, today announced a collaboration with Sistine Solar, Inc.- a company that uses innovative design to change the way the world thinks about solar power – to produce a one-of-a-kind solar canopy for the Element brand. Starting today, Element Dallas Fort Worth Airport will debut a nature-themed, custom designed charging station that allows guests and locals to relax as they recharge their devices through the power of sunlight. A recognized industry leader in the eco-space, Element offers travelers a fresh, reimagined extended stay hotel experience. This collaboration is a continued proof point of the brand’s commitment to sustainability and eco-design, further demonstrating how sustainability and socialization can go hand in hand. Just as Element has redefined the extended stay category through its contemporary design philosophy and eco-minded sensibilities, Sistine has transformed the bland, familiar aesthetic (think: boring black and blue grid) of solar technology. By using techniques from a wide range of disciplines – including mosaic art, solar photovoltaics, and optics – Sistine has developed SolarSkin, a patent-pending technology to create high-efficiency solar panels of any design, pattern or color. 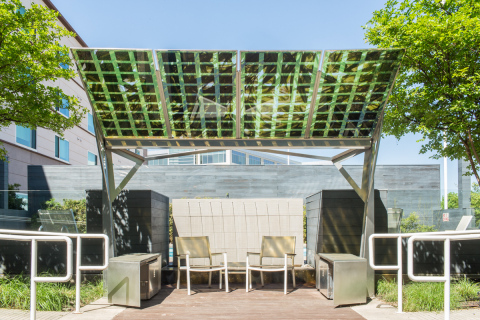 The one-of-a-kind solar canopy at Element Dallas Fort Worth Airport is inspired by the Element brand ethos that modern design flows from nature. Its unique design proves that green can, and should be, gorgeous. Built as an off-grid installation, the unique Solar Canopy charging station, designed in partnership with Brooklyn-based architect, Ajmal Aqtash, will allow guests to sit in the shade, socialize and relax outside of the hotel as they recharge their personal electronic devices by harnessing the power of the sun. Additionally, the canopy has integrated LEDs that allow for nighttime illumination and enjoyment. As the panels absorb sunlight, solar energy converts the light into electricity, which guests can then use to charge their devices. As Starwood’s eco-innovation lab, Element is the first major hotel brand to mandate that all properties pursue the U.S. Green Building Council’s Leadership in Energy and Environmental Design (LEED) certification for high-performance buildings. Offering bright, modern design and sustainable-minded sensibilities, Element Hotels are meant to fuel a life of balance while on the road, particularly when traveling for extended periods of time. The brand is a leader in the eco-innovation space and continues to pilot latest developments in sustainable technology. The solar canopy is currently at Element Dallas Fort Worth Airport North with plans to expand globally to Element’s nearly 20 hotels around the world. For more information, please visit www.ElementHotels.com. Element is experiencing incredible growth momentum. With 19 deals signed in 2014, the brand is on track to triple its portfolio by 2017. On the heels of opening its first hotel outside of North America in Frankfurt, Germany, Element will open its first hotel in China in 2015 followed by new hotels in London, Amsterdam, Boston and Philadelphia, signifying the global appeal of the brand. Element(R) Hotels is made to order for guests in the know and on the go. Its bright design defies convention, bathing guest rooms and public spaces in natural light. Stylish and sustainable throughout, Element offers extended stay comfort with a conscience and lots of signature amenities from its healthy RISE breakfast and RELAX evening reception to saline swimming pools, spacious fitness centers, bikes to borrow and electric vehicle charging stations. Starwood’s latest brand innovation, Element made history in 2008 as the only major hotel brand to pursue LEED certification for high-performance buildings brand-wide. To date, there are 17 Element Hotels worldwide, with 16 in North America and one in Europe with new domestic and international hotels in development. Visit www.ElementHotels.com or connect on Facebook. Starwood Hotels & Resorts Worldwide, Inc. is one of the leading hotel and leisure companies in the world with more than 1,200 properties in some 100 countries and over 180,000 employees at its owned and managed properties. Starwood is a fully integrated owner, operator and franchisor of hotels, resorts and residences with the following internationally renowned brands: St. Regis(R), The Luxury Collection(R), W(R), Westin(R), Le M’eridien(R), Sheraton(R), Four Points(R) by Sheraton, Aloft(R), Element(R) and the recently introduced Tribute PortfolioTM. The Company boasts one of the industry’s leading loyalty programs, Starwood Preferred Guest (SPG(R)), allowing members to earn and redeem points for room stays, room upgrades and flights, with no blackout dates. Starwood recently announced plans to spin off its Starwood Vacation Ownership, Inc. business, a premier provider of world-class vacation experiences through villa-style resorts and privileged access to Starwood brands, into a standalone public company by the end of 2015. For more information, please visit www.starwoodhotels.com. Sistine Solar, Inc. designs beautiful solar panels and seamlessly integrates them into rooftops, ground arrays, and outdoor furniture. For us, solar is a design element, not a technology that should be hidden from view. We are working to convert the world to 100% clean energy in our lifetime, changing perceptions through stunning design. Our latest product, SolarSkin, allows us to create solar panels that display any color, pattern, or image, creating an array that is both beautiful AND sustainable. For more information, check us out on www.sistinesolar.com.